Size of this preview: 491 × 600 pixels. Other resolutions: 196 × 240 pixels | 393 × 480 pixels | 629 × 768 pixels | 838 × 1,024 pixels | 4,748 × 5,800 pixels. 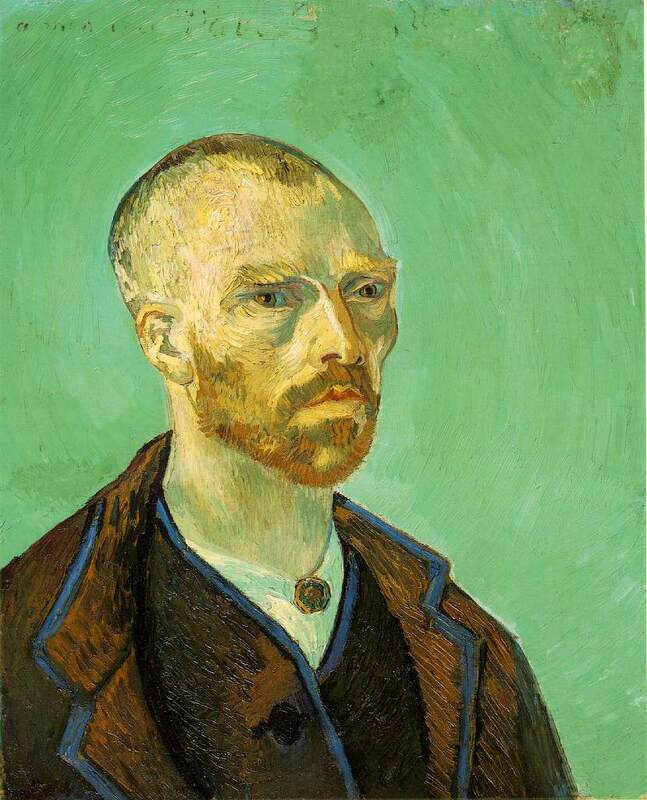 label QS:Len,"Self Portrait (dedicated to Paul Gauguin)"
label QS:Lde,"Selbstbildnis (Paul Gauguin gewidmet)"
Object history Vincent van Gogh, Arles, (1888,) gift; to Paul Gauguin, (1888-1897) sold. [Ambroise Vollard, Paris.] [Paul Cassirer Gallery, Berlin.] Dr. Hugo von Tschudi, Berlin, (1906-1911), by descent; to his widow, Angela von Tschudi, Munich (1911-1919), to Neue Staatsgalerie, Munich (1919-1938); removed from the collection by the National Socialist (Nazi) authorities in 1938, consigned; to [Theodor Fischer Gallery, Lucerne, Switzerland, for sale June 30, 1939, lot 45]; to Maurice Wertheim (1939-1951) bequest; to Fogg Art Museum, 1951. F476: Faille, Jacob Baart de la ( 1970 ) [ 1928 ] The Works of Vincent van Gogh. His Paintings and Drawings, Amsterdam: J.M. Meulenhoff, no. 476 . JH1581 : Jan Hulsker (1980), The Complete Van Gogh, Oxford: Phaidon, no. 1581.